Prepare cornbread mix according to package directions. Cool and crumble. Toss with bread cubes, onion, sage, salt and pepper. 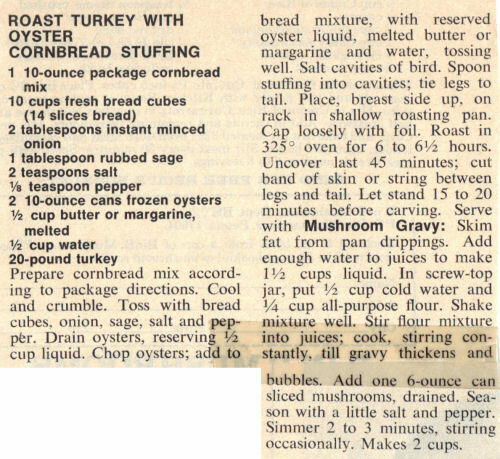 Drain oysters, reserving 1/2 cup liquid. Chop oysters; add to bread mixture, with reserved oyster liquid, melted butter or margarine and water, tossing well. Salt cavities of bird. Spoon stuffing into cavities; tie legs to tail. Place, breast side up, on rack in shallow roasting pan. Cap loosely with foil. Roast in 325° oven for 6 to 6 1/2 hours. Uncover last 45 minutes; cut band of skin or string between legs and tail. Let stand 15 to 20 minutes before carving. Skim fat from pan drippings. Add enough water to juices to make 1 1/2 cups liquid. In screw-top jar, put 1/2 cup cold water and 1/4 cup all-purpose flour. Shake mixture well. Stir flour mixture into juices; cook, stirring constantly, till gravy thickens and bubbles. Add one 6-ounce can sliced mushrooms, drained. Season with a little salt and pepper. Simmer 2 to 3 minutes, stirring occasionally.